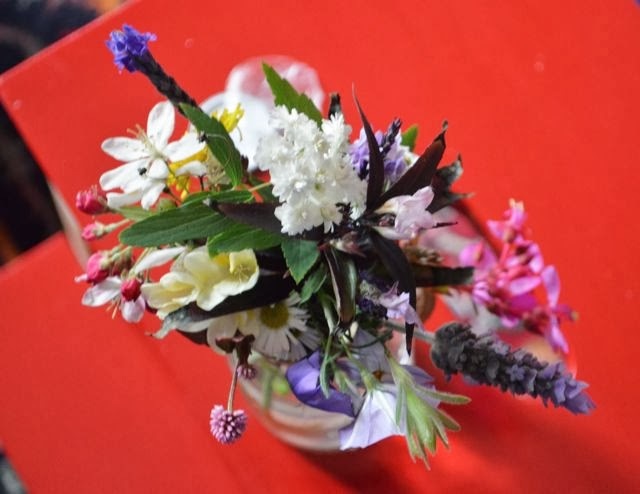 On Tuesday, as Lil and I walked the short distance home from kinder, we picked a little posy from the flowers poking out of people's front gardens. This is something I did endlessly with the older girls, but the rhythm and traditions of their early years are, I often feel, lost to me now. There was a certain cycle of work I was in - off work for a year with a baby, back to work for a year, off work for a year with the next baby - and so on for eight years. 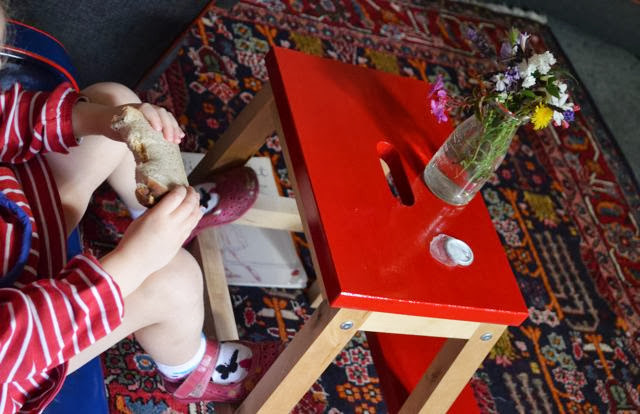 In my 'back to work' year, I worked part time, and even when work was at its most absorbing, I was either breastfeeding or pregnant, physically anchored in the world of early childhood. I'd cycle in to work and gear up intellectually for the day, and cycle home and wind down, ready to be reabsorbed into the countless daily tasks and minutiae of mothering small children. Lil is still a very small child, not even four yet. And I still work part time and have two days a week home with just her. But our days together are not the same as my days with the other kids. When Ruby was four I had a two year old and a newborn. I think I gave myself over much more fully to the requirements of the job. I didn't expect to get anything done, other than to look after the kids; baking and visiting friends and making playdough and going to the library was the stuff of our days. With Lil, though, it can feel as though our lives have already moved onto the next stage and she has to keep up. She stays up later and watches movies the others would never have seen at her age. I don't put on funny voices or read stories at dinner time anymore to entice her to have another mouthful and I can hardly believe I ever did that with the others. My days standing at the swings and endlessly pushing small children are over. I can't do it anymore. I'm not interested in making the connections with other mothers that I once eagerly sought. I know enough mothers now. My cycle home from work no longer clears my mind and leaves me prepared to step back into family life. Work encroaches on my thoughts and emotions. It's like a magnet, or a vacuum, drawing me toward it and requiring energy to withstand its dark attraction. Picking this little posy with Lil took me powerfully back to those early days, and left me a little melancholy for all that she has missed out on, from me. I assuage my guilt by assuring myself that she gets plenty of zoo and library and parks with Kim. Guilt is a useless emotion, anyhow, and I don't really feel guilt so much as wistfulness for that time that has now gone, and the knowledge that I can't go back to it, or back to the person I was and the mother I was then, even if I tried.